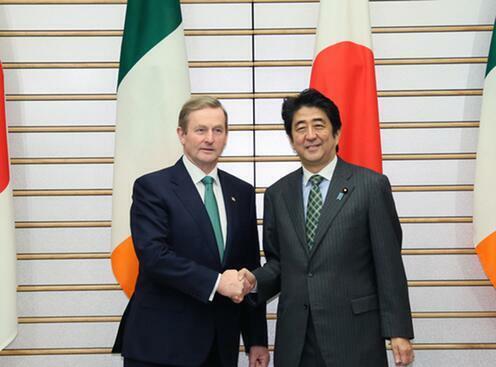 The Taoiseach today welcomed the announcement by Japan that it is re-opening its beef market to Irish exports. The decision means that Japan is open to Irish beef for the first time since 2001 and marks Ireland as one of a select group of countries allowed to export beef there. The announcement comes during a week when the Taoiseach, Enda Kenny, accompanied by Minister for Agriculture Simon Coveney, is leading a major trade mission to Japan. The mission includes a special programme for Irish food exporters seeking market outlets in Japan. The decision to allow access for Irish beef to Japan comes after a meeting between the Taoiseach and Minister Coveney with Japanese Prime Minister Shinzo Abe in Tokyo. Bord Bia estimates that the short to medium term opportunity for Irish beef in Japan is worth between €12 and €15m with potential for significant expansion beyond that over time. Commenting on the Japanese decision, the Taoiseach said: “It is clear that the agri-food sector is a significant driver of economic growth and employment in the Irish economy. With Food Harvest 2020 we have established a vision for the sector, which is being delivered on through a positive and collaborative approach from Government, farmers and industry. Minister Coveney said the decision to allow access for Irish beef to Japan was very significant and reflected Japanese confidence in the integrity of Irish food safety systems and in the quality of Irish beef. The landmark decision taken today is the fruit of detailed technical negotiations between the Department of Agriculture and its counterpart in Tokyo over the past two years, and is true testament to the quality of Ireland’s beef output. “Today’s announcement proves yet again the value of investing in our sustainability and traceability systems and more importantly being able to verify these claims to global customers,” the minister concluded.